There was a sudden change in the weather mid-February with sunshine and record temperatures across the UK. 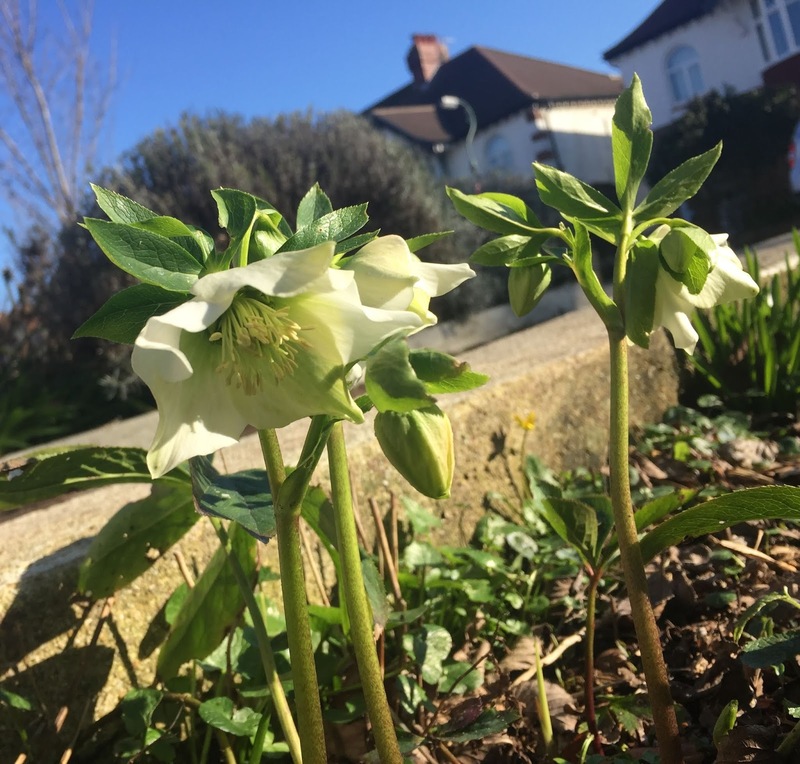 In Hove the daytime temperature in the middle of February was as high as 15C and this spring-like weather has brought a flurry of activity on the allotment....and a sure sign that Spring is on the way, my Hellebores at home are in flower. I had managed to clear half of the area needed for my first early potatoes earlier in the month and fortunately Luke was on hand to help me finish the job. A giant cardoon, over 2.5 metres tall and 2 metres wide, which was engulfed in bindweed had been moved from this area, leaving a large hole about half a metre deep. When we dug the area around where the cardoon had been, we managed to fill the wheelbarrow twice over with bindweed roots some of which were 6mm thick. No doubt we left some behind so we will need to be extra-vigilant and ready to tackle the weeds as they show through. From time to time we are reminded why we subject ourselves to all of this when we reap the rewards. Purple sprouting broccoli is one of my favourite vegetables and we are having a wonderful harvest. The Cavolo Nero has finally finished and going to seed and we have salvaged the last few leaves, pulled up the plants and given the ground a preliminary dig in preparation for planting the second early potatoes. The spring like weather has also encouraged me to sow some early peas indoors. There are several early varieties that can be sown in January or February but I haven't had much success with these in the past. 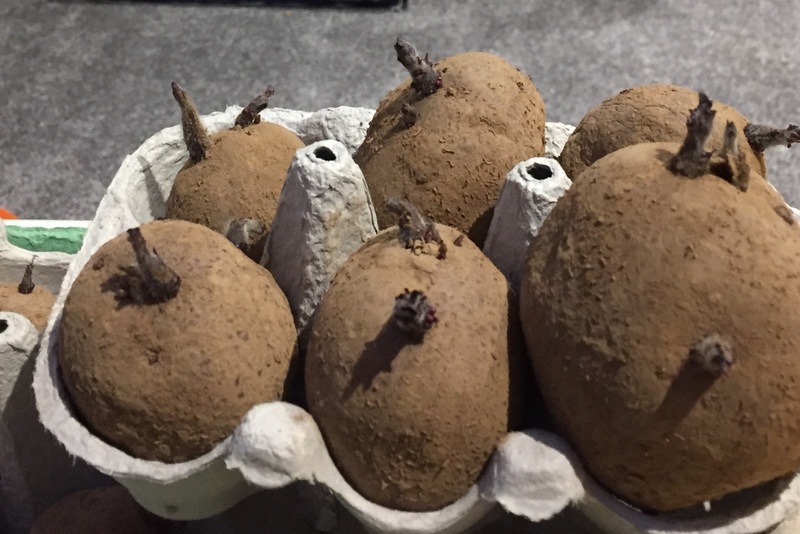 Kelvedon Wonder has always been a heavy cropper and, although the recommendation is to sow indoors in March, I have taken a risk and sown some this month. 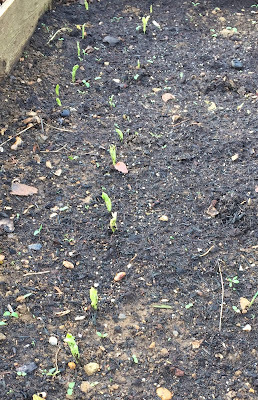 The added joy is that they germinate quickly and I had seedlings showing within a week. When they were about 5cms high I put them outside during the day to harden off, covering them with a cloche at night. 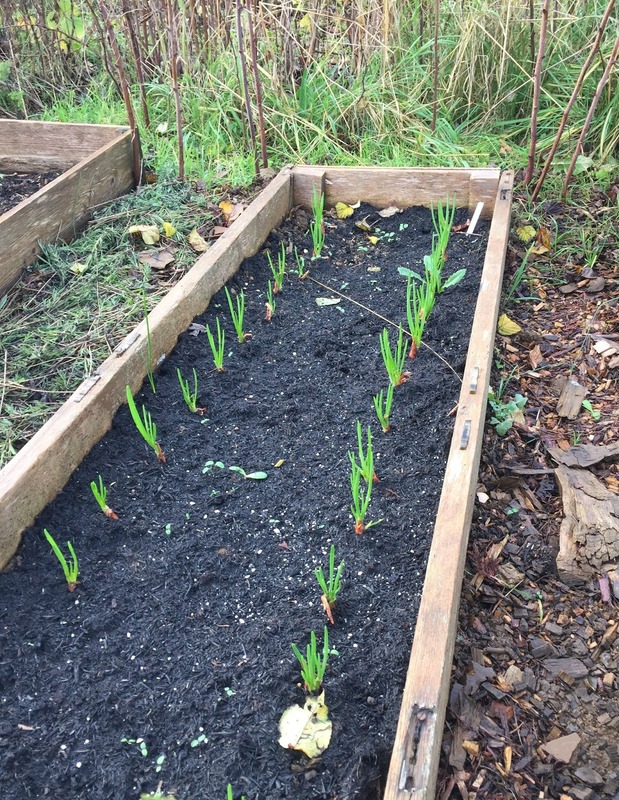 I have also sown my first leeks and it was so satisfying to see them sprouting within a few days. The worms in our wormeries were very well fed over the Christmas and New Year period and they have produced some rich compost, which I have spread over the remaining empty raised beds. The couch grass and perennial weeds which we dug up in the autumn, with great clods of heavy earth adhering, has been sitting in a great heap over the winter. 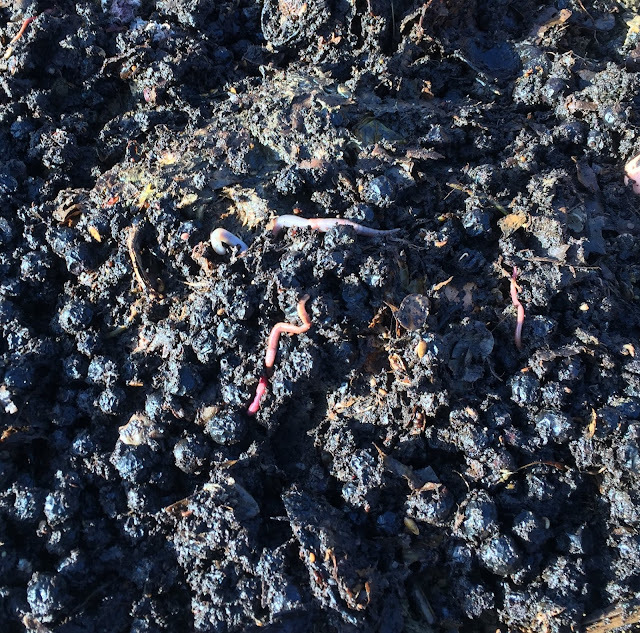 With a fine sieve, Sylvi has been busy riddling, recovering as much soil as possible, leaving the roots and any remaining vegetation to go to the dump - ie civic amenity site - where it can be properly composted. The remaining fine soil has been added to the raised beds mixed with some well rotted compost. Parsnips are notoriously difficult to germinate but I have had modest success in past years. I had some seed tapes left over from last year so have taken a chance by sowing them in one of the raised beds. Nothing venture, nothing gain! I have also sown a couple of rows of Boltardy beetroots, having just lifted the final remaining ones from last year. I raked the area which we had prepared for the first crop of potatoes and then made four shallow trenches about 6 inches deep in which I put a layer of peat-free potting compost. and inspected the Duke of York first earlies which looked almost ready for planting. I hope we have not been deceived by this false-spring but decided to plant them on Sunday 24th February, under blue skies and warm sunshine with the temperature approaching 20C! The recommended distance between rows is 28 inches (71 cms) and for the potatoes to be 12 inches (30 cms) apart. I usually plant them a little closer - my rows are 2 feet apart (61 cms) and I planted the potatoes 10 inches (25 cms) apart. 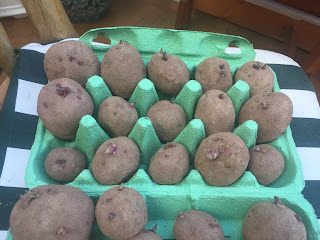 I planted the potatoes in the trenches at a depth of 6 inches (15cms), covered them with peat-free potting compost and then raked over the surrounding earth to form low ridges. I then gave them a light watering and a top dressing of an organic potato fertiliser. As the shoots sow through I will regularly rake over surrounding soil, increasing the height of the ridges and keeping them covered until the risk of frost is reduced. With the continuing warm weather, I have planted out the first batch of peas. On the last day of the month, temperatures began to fall - but they're still higher than average for the time of year - and rain is predicted for the next few days. 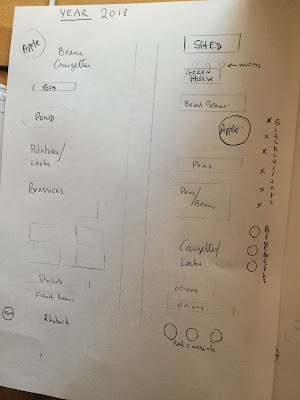 February started with a mixture of sub-zero temperatures and torrential rain so there was little prospect of early progress outdoors so we concentrated on what we could do indoors. 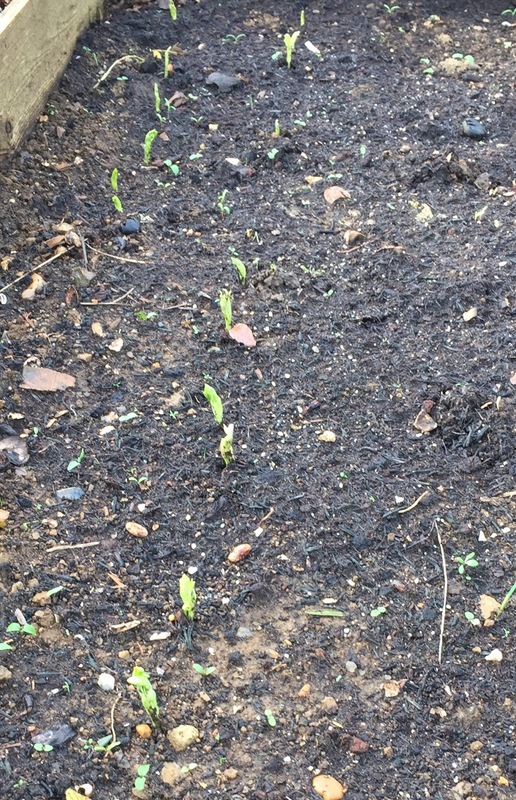 In January, I had sown some broad beans in covered trays outdoors but they became waterlogged and then froze solid without any chance of germinating or recovery. I thought I would make up for lost time and sow some Aquadulce broad beans indoors. 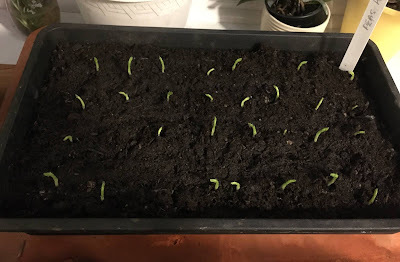 I used seeds that we had saved from last year's crop and, having discarded any that were damaged or attacked by pests, most seem to have germinated. Between showers we managed to get up to the plot to feed the worms and drain the blueberries, whose pots had become waterlogged, and review progress. We picked some cavolo nero but it is beginning to go to seed so our supply is coming to an end. 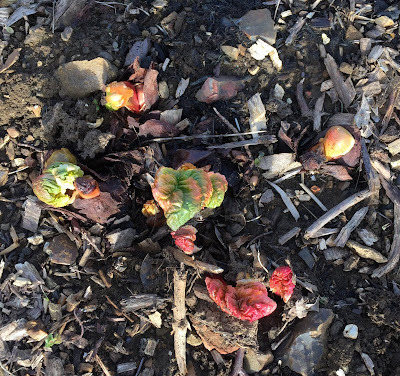 But the good news is that the Early Purple Sprouting Broccoli is sprouting! And we have a plentiful supply of leeks which, thankfully, are disease free and have not succumbed to the virus which seems to have infected several other sites in Brighton and Hove. I had put the seed trays with the broad beans in the coldest room in the loft with an overhead window. The result was that the beans grew very tall and straight - or a bit leggy! I hardened them off outside in anticipation of a warm day for planting out. Fortunately, the weather changed for the better on 12 February and it was almost spring-like. The following day was also dry and sunny, so we took the opportunity of planting them out . With more than a little help from Sylvi, we cleared the area around the blueberries and began to clear a patch for planting the First Early Potatoes. We had begun to pick purple sprouting broccoli earlier in the month and I am very thankful that I remembered to net the plants to keep off the pigeons. A week or so after our first picking, more strong healthy sprouts had grown which will provide us with a good haul for the weekend. We have also been busy weeding around the blackcurrant bushes but some were so choked with couch grass that I actually lifted them, cleared the couch grass and replanted them with a dressing of blood, fish and bone and pruned them. Blackcurrants fruit on newer wood so it is OK to cut back some of the branches fairly hard to encourage new growth and new shoots. 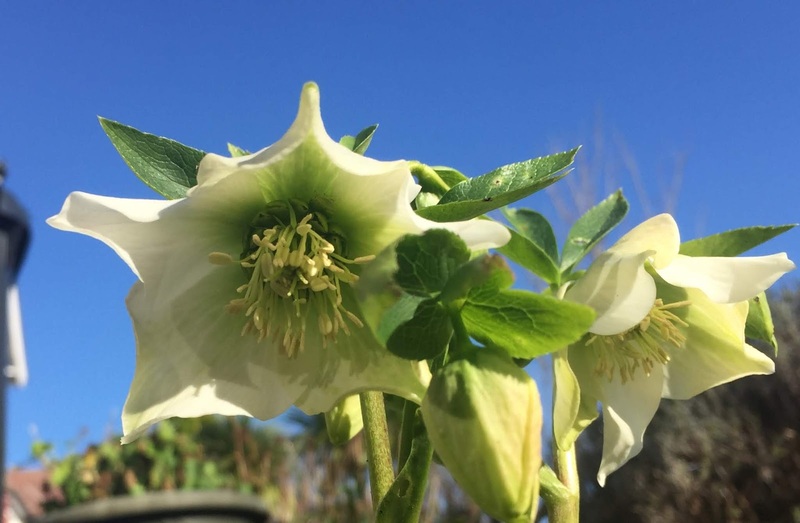 It is advisable to cut down about a quarter of the old stems to just above the soil and remove any weak or diseased stems and any that cross over the centre of the bush. Redcurrants, on the other hand fruit on the older wood so need to be pruned differently. Obviously it is advisable to remove any dead, diseased or damaged stems to keep an open bush. Redcurrant bushes can grow very large so to keep them at a manageable size I removed about 10cms from the growing stems and cut out some of the older ones to keep an open bush. I have acquired a small fruit cage (having lost the entire crop to the birds last year) and it is just over 1m high so this determined how far back I needed to prune the branches. Similar pruning is needed for gooseberries - remove the 3-Ds - damaged, diseased or dead branches; cut out cross branches and then lightly prune the remaining ones. It is advisable to wear gloves when pruning gooseberries! I am also busy indoors this month. Outdoor cucumbers would normally be sown outdoors in May but some varieties can be sown indoors in February or March and planted out in May producing early fruits in July. 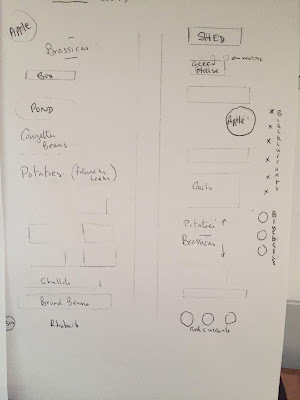 I'm trying Mr Fothergill's Marketmore this year but am also sowing some Spanish Pepino Marketer seeds for a later crop. Leeks can also be sown indoors in February for planting out in May or June. I'm sowing some Musselburgh which is a tried and tested, reliable variety. 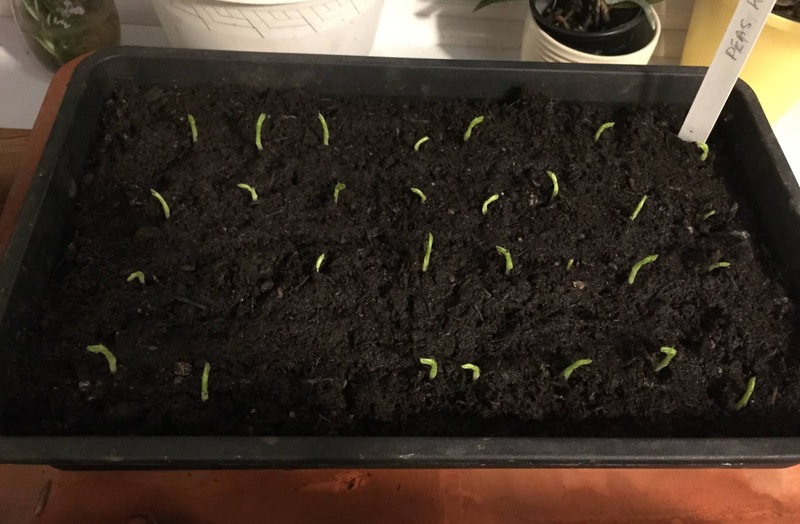 I am also starting off some early peas indoors and some Habanero chilli peppers from seeds harvested from last year's crop. Once we have cleared and prepared enough space for the potatoes the next task will be to dismantle the frames which were used for growing runner beans and cucumbers last year and clear that space for the brassicas. The runner bean frames need some tlc and I need to dig a couple of trenches where the beans will be planted and fill them with kitchen waste and old newspapers - this will help provide nutrients but also help with water retention which is particularly important if you don't want tough, stringy beans. I recall that in the 70s we buried an old flock mattress under the beans on the Cherry Orchard allotment in Charlton. I haven't seen a flock mattress in years, soit will just be newspapers and kitchen waste this year. 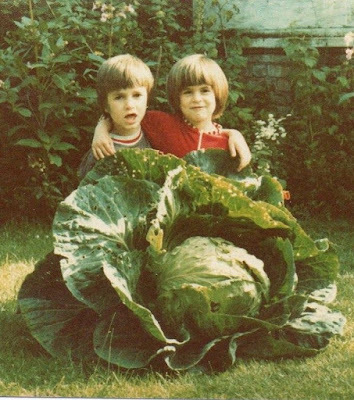 I don't have any pictures of the Charlton beans but I have found a photo of one of the cabbages. To avoid any confusion, the cabbage is in the foreground, the others are two of my children! 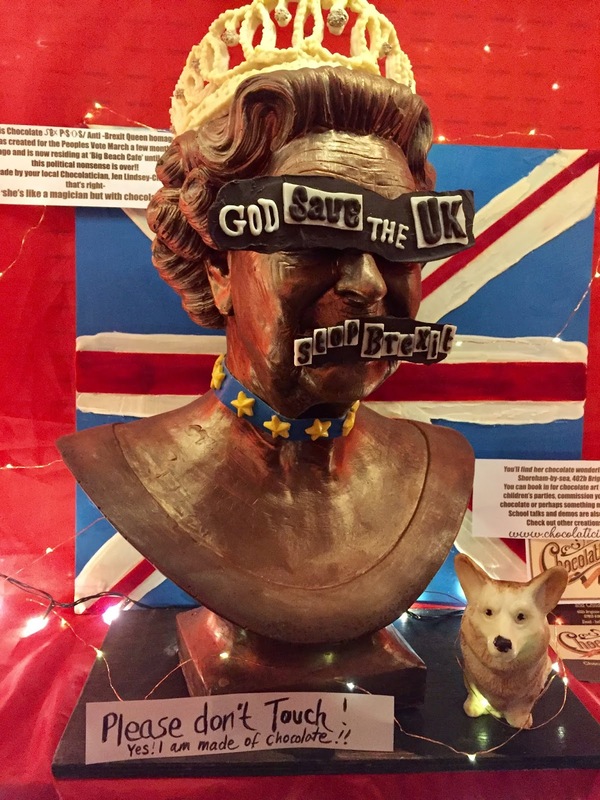 The Queen was in chocolate - my drink was a little more alcoholic. There's always a raffle at a Labour Party social and we were able to offload some of our jam and marmalade as prizes - and we won someone else's picalilli! It has been a busy couple of weeks so I'll close this blog and start a fresh one for the second half of the month.